Investors have been fairly cautious in the second-half, with money managers and analysts predicting an imminent correction. Are we still waiting for the Correction? The Year is almost up! The second-half witnessed many prognostications from luminaries about an imminent major correction in the stock market. But months have continued to pass and the markets have recorded all-time highs. The prognosticators may well be right about the stocks market, but not in 2016! Fortunately, the year 2016 has been a better year to make money in stocks compared to 2015. As of December 1, the small caps had the best performance amongst major indexes, with the Russell 2000 (IWM) index up +16%, strongly overcoming the negative -6% performance in the prior year. As of December 1, the small caps had the best performance amongst major indexes, with the Russell 2000 (IWM) index up +16%, strongly overcoming the negative -6% performance in the prior year. The S&P 500 (SPY) was up +8%, compared to a decline of -1% in 2015, while the Nasdaq (QQQ) was up +6%, closely tracking the 2015 performance. Thus far, we are fairly close to the mark, with only the Russell 2000 performing better than expected for 2016. Following the above template, and after being in cash for the first quarter fo 2016, we have maintained the course with stocks and that has worked out well. As of December 1, the Graycell Small Cap Portfolio was up over +70%, and the Prudent Biotech Portfolio was up over 7%, compared to the benchmark Biotech ETF (IBB) decline of -19%. The Federal Reserve (Fed) rate increase last week was widely anticipated, and consequently, much of the attention was fixated on the commentary guiding the path of interest rates in 2017. The dot plot revision of projections by the Federal Open Market Committee (FOMC) members indicated 3 potential increases, up from 2 earlier. This was somewhat anticipated and is not a major concern at this point. Keeping in mind the dual mandate of the Federal Reserve to foster price stability and maximum employment, the possibility of a steeper path of rate rise than projected may be triggered, if at all, more from higher inflationary indicators than from strong employment data. Inflation has risen, but the core gauge reading of 1.4% still remains below the long-term FED objective of 2%. The inflation expectations remain well-anchored at this time and show gradual progress. There are many opposing forces at play now with the rising dollar, energy prices, import prices, slight wage improvement, etc., that largely offset each other in terms of their impact on inflation. However, with the new administration formalizing its policies next year – infrastructure spending, trade negotiations, tax cuts, etc. – it remains to be seen if collectively the new policies raise inflation expectations. This is something that will be relatively clearer from the second quarter of 2017. Interestingly, inflationary expectations presently are running meaningfully below what they were in prior interest rate hiking cycles of 1994-1995 and 2004-2006 when in both cases inflation was already ahead of 2% at the time of the second rate hike. In November, the Federal Reserve Bank of Cleveland published a commentary questioning the likelihood of inflation even reaching 2% over the next 3 years. It is important to recognize that markets can adjust to rate increases. What worries the market is for an overactive FED to choke off the economy through mistimed rate increases, leading the economy into a recession and stocks into a bear market. The market is not in any such danger, with the FED continuing to show restraint and a willingness to err on the side of caution. The FED should receive credit for demonstrating tremendous patience and allowing the broader economy and financial conditions to Heal. The FED’s action does not suggest the economy will be stifled by untimely rate increases, and such increases will occur only when the data and broader risk environment justifies it. Monetary Policy remains bullish for stocks. The economy continues to grow at a measured pace, with many major key indicators pointing higher. The GDP advance estimate of 2.9% growth in the third quarter was raised to 3.2% in the revision and is the highest growth recorded in two years. This does not mean the economy is going to grow at that pace in the future quarters but is suggestive that the economy is growing at a stable and steady pace, a key condition to support stock valuations. The cyclical Industrials (XLI) and Materials sectors (XLB) have also moved sharply higher. The economic picture is only anticipated to strengthen at this point, based on an expectation of stimulative policies, including tax cuts. The extent and scope of such policies remain unclear at this point. But what is clear is an expectation of higher economic growth once the new administration assumes office. There are many indicators that suggest a higher probability of improving economic growth. For this article, we would like to briefly point out a few confidence measures. 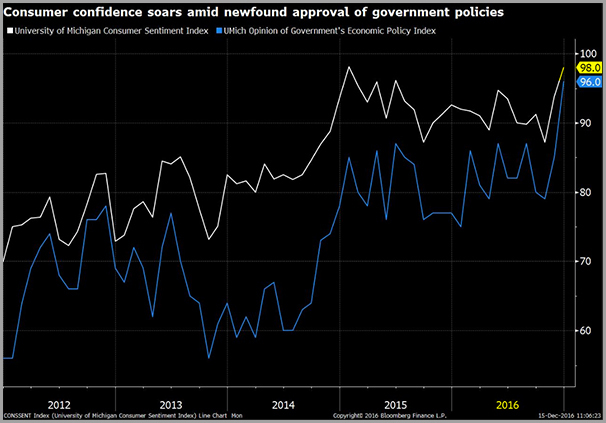 One of them is Consumer Confidence, which surged in December as optimism about future climbed to an 11-year high, as per the widely followed University of Michigan survey. This optimism should have a natural transition into elevated consumer spending. 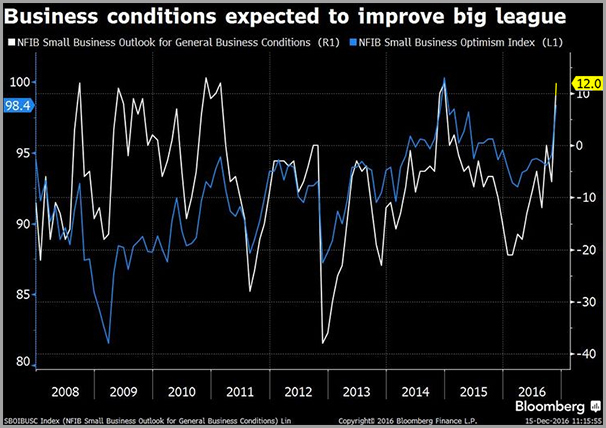 Small Business confidence, as measured by Independent Businesses' Index, posted its sharpest surge since 2009, and should enhance small business hiring down-the-road. 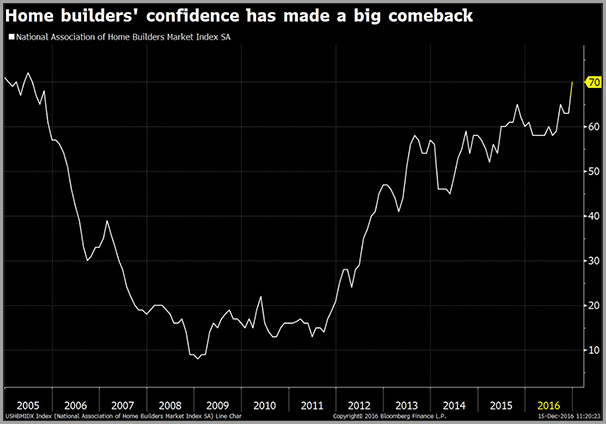 The Homebuilders' confidence index (ITB) (XHB) rose to an 11-year high in December, even after a surge in bond yields following the election. Single confidence measures can be volatile and change direction quickly. But taken collectively, many different confidence measures suggest strong grounds for an uptick in economic activity. This bodes well for the economy and the stock market, as major corrections or bear markets are typically triggered by an expectation of an economic recession and not an uptick in economic activity. Earnings were already on an upswing following the third quarter, and the growth is going to get better. S&P 500 earnings rose 3.2% in the third quarter, reversing a trend of declining earnings for five quarters since the March 2015 quarter. If one notes that the estimate for third-quarter earnings as of September 30 was a decline of -2.2%, then this was an earnings swing of +5.4%. The estimate for fourth-quarter earnings growth is 3.3%, and we believe it will prove to be conservative. The earnings buoyancy is across multiple sectors, but key surprises will be coming from Financials (XLF), Energy (XLE), and Technology (XLK). The Financial sector has received a tremendous boost following the elections, with a 20% rally, driven by the resetting of the term structure. The yield spread between the 2-year and 10-year Treasuries has risen nearly 30% since the elections. Such spreads are creating a more profitable loan portfolio for banks, which will begin to be partially reflected as early as fourth quarter earnings. The sector-wide earnings lift will benefit both large and small banks including JP Morgan (JPM), Bank of America (BAC), Goldman Sachs (GS), Morgan Stanley (MS), and regional as well as smaller banks like BOFI Holding (BOFI). The Energy sector, which last quarter had reported the biggest upside earnings surprise as per Factset, has received a significant boost from a production cut agreement covering OPEC members and major non-OPEC oil producing nations. The fourth quarter will begin to show early benefits of the price surge on the bottom-line of the energy sector. At some point, there is an offsetting benefit of rising oil prices as they approach and move beyond a breakeven point for shale oil producers and the dormant Canadian oil sands, which can lead to rising rigs count and a production spike in the second-half of 2017. The Technology sector has continued to deliver strong earnings growth since the June quarter. The Information Technology sector of the S&P 500 had the highest percentage of companies exceeding earnings estimates during the third quarter, and the sector will once again deliver a strong performance for the fourth quarter. Microsoft (MSFT), Netflix (NFLX), Google (GOOG) (GOOGL), and Apple (AAPL) were some of the large caps that delivered solid earnings last quarter, while Facebook (FB) and Amazon (AMZN) had disappointed. Last week, Oracle (ORCL) disappointed while Adobe (ADBE) exceeded estimates. Business spending should begin a long overdue turnaround based on the expectation of stronger economic growth, and this, in turn, should assist technology companies further. Heading into next year, there will be some offsetting influence from a stronger dollar which creates a drag on export earnings. Much of the dollar strength has been driven by a higher expectation of interest rate increases during 2017. That expectation may likely be recalibrated if the FED is not provoked by data or circumstances, and continues to show restraint. As we head into 2017, we believe one should remain invested, partially at least if not fully, and consider some rotation into sectors that have lagged the markets, like the Healthcare (XLV) and Biotech (XBI). There will be a period in January leading up to and after the inauguration, when the market can pull back to consolidate and settle down for earnings announcements. The biggest risk for 2017 will be the policy framework of the Trump administration. The market is expecting an aggressive rollout of policies that spur growth. If the administration is unable to deliver by getting bogged down with controversies or policy differences between the new White House and the Republican-controlled Congress, this will lead to a resetting of expectations downwards. Till such time there is further evidence of this risk rising in probability, the prudent course is to stay invested. The strong market move to new all-time highs, along with a growing risk appetite, demonstrates compelling momentum. At this time, we believe the first-half will be better for stocks, than the second-half, primarily because of fear of unrealized expectations. For the year, we believe the major indexes of S&P 500, Nasdaq, and small cap Russell 2000 to post double-digit gains. As we have mentioned in the past, the markets have a way of writing their own narrative. None of our forecasts may come true, and we may be staring at a major correction or a bear market. Markets do not follow a calendar and change character because it is the beginning of a new month. Opinion pieces do not make money, but they provide a framework to view and guide things. Eventually, it is important to work within an investing system and continue to recalibrate our judgment as market conditions evolve. Please point out any errors or share your viewpoint below in the Comment section to assist other investors.